This case is about an art gallery, which means it is far from the normal “TOC environment” where we all feel we know what to do. TOC knowledge is not a requirement, but it could provide guidance. Please, send me your ideas to my email, elischragenheim@gmail.com, or comment here at the blog. I’m sorry I cannot provide any prize other than mentioning you in one of my posts when I publish my take on the case. Is there a future for the WideArt Gallery? Sergey worked hard for ten years to materialize his dream of opening his own art gallery in Philadelphia. He loved art, knew a lot about it and he especially knew well the artistic situation in Philly. His idea was to offer good art at affordable price. The WideArt Gallery contained four rooms. Each had pictures and sculptures for prices that fall within a certain price range. The cheapest one contained lithographs and other pictures valued from $100 up to $500. Next room contained items up to $1,500. The third room’s prices went up to $5,000. The last room contained the most expensive pieces of art. Naturally it contained outstanding works of art and most visitors spent more time in that room than in the others. Problem is that Sergey felt somewhat disappointed from the amount of sales. The gallery attracted quite a lot of people who came in to look at fine art for free. Some people even commented that they expected more new items to be displayed since their last visit to the gallery. Eventually relatively small percentage of the visitors showed an interest to buy an item. Still, the gallery made enough money to provide reasonable living for Sergey and his family, but not much more. Sales improved a little after Sergey published an article on “How to place art in your home for great effect” in a known home design magazine. He made copies of the article so every visitor to the gallery could take one. Rudolf Kempe entered the gallery on July 20, 2015. A date Sergey will remember all his life. Rudolf, an important tycoon with diversity of businesses, is widely known for his colorful appearance and innovative ideas, which few of them made him billions. Rudolf went through all the rooms in the gallery without much attention to the pictures on the wall. Instead he watched the people in the gallery watching the pictures on the wall. Then he saw Sergey sitting at the counter looking at him. Sergey immediately recognized Rudolf and simply hoped he might buy something expensive. However, fine art did not interest Rudolf much. Instead he approached Sergey and asked if he could spare the time to have coffee with him. The conversation in the nearby coffeehouse took almost an hour, a very long time for such a talk for Rudolf, who showed keen interest in the business called “selling art”. “Dear Sergey, you tell me your business is constrained by two things. One is that your working capital prevents you from buying additional excellent and relatively cheap pictures. The other is being constrained by the space to hang pictures. Are you aware of the clash between your allegedly two constraints? You told me that items that are not displayed are not sold! What would you achieve with higher stock of art items if your display is limited? How do you think the rate of sales to stock would improve if you have more stock? Can you help Sergey to come up with a good idea or even several ideas? Hi Eli, thanks for that riddle… I believe that the full solution is much broader than what I’m writing, but I will give some directions: 1. Sergey suffers from low freshness – this is why he feels the need to buy more stock. however, his cash is tied because he is not selling fast enough. 2. Not only the cash is tying his hands, but also the fact that he doesn’t have space – this is also deriving from the fact that he is not selling fast enough – if he sell fast enough, presentation space would become available for new fresh items. 3. I’m not sure from the data above, but probably, Sergey is creating some choice overload on his visitors which is also contributing to the low rate of sales – people rather postpone their decision than to take a “wrong” decision. I would say that Sergey need to put his focus on 2 main issues: 1. Flow and Freshness: Identify the products that occupy shelf space with low chance to be sold and take actions to remove them from display: a. price reduction, b. reselling it to another gallery. the identification can be hard, but Sergey can sense which pieces are attracting more attention and which are not, by, for example, testing the time that people are standing in front of an art piece. This operation will free space in a higher rate, allowing freshness which will result in better walk-ins and returning clients. 2. Sale process: Sergey need to put an effort and to create standard sale process that he or his staff will follow: a. ask few questions (not more than 5), b. identify the need of the specific client following those questions, c. focus the client to the pieces that could interest him/her, showing him narrow range to select from. Since the gallery is organized by price range, it can help to create the focus mechanism to the client. Sergey can even take it to the next level and provide a map or an i-Pad to help the visitors focusing their efforts and attention while they are visiting his gallery. This operation will increase conversion rate which will also contribute to free shelf space for new pieces. To support this kind of operation, Sergey needs to hold some buffer of new items for each category (shouldn’t be too much – depend on the time it takes for Sergey to buy a new piece) – in order to replace the free space with new piece. In the case of arts, most of the items are “one piece” (unique) that can’t be sold twice. So, talking about availability of the best sellers is not relevant here. however, Sergey can improve his offering by learning the trends of the products that he is selling to understand which type or characteristic of a product are better for his visitors. 1. the cheap and moderate priced art will get more exposure from visitors interested in the outstanding art, by that we will increase their chance to buy something. 2. mixing the differently priced art in the same room has a good chance to create price differentiation, increasing the chance of customers who intended to buy cheaply-priced art to buy something more moderately-priced. If this is a riddle with a specific answer, then surely I have not found it. If this is an open-ended riddle, a search to create the most interesting-looking thing out of the parts provided, then I submit the following thing, inspired in equal parts by Amazon and Walt Disney World, which I believe to be interesting, if nothing else. When walking through Walt Disney World you are not simply shown rides and attractions, you are given a visual narrative. If you want to ride Pirates of the Caribbean you must go to Adventureland, where you are first surrounded by exotic scenery from locations around the globe. If you want to ride the Haunted Mansion, you must first go to Liberty Square, and insert yourself into a world of classical American architecture. So what Sergey might need in order to boost his gallery’s effectiveness, is Tomorrowland. While art is a classical endeavor, and the traditional gallery setting should always be the primary display method, Sergey could section off one wing of his gallery for a different look that may be more appealing or easier to navigate for some portion of his client base. And this wing would address both his issues of display space and capital. Enter Amazon. Amazon perfected the idea of virtual shelf space, a display of many options without taking up any additional space. This cannot work for art if applied directly, however combining the virtual with the physical could create a new, appealing dynamic. Reserve a certain section of art works and have them digitally scanned at as high a resolution as possible, and place them on high-definition displays in a slideshow configuration, allowing you to potentially display as many pieces as you have in stock on a single wall, albeit not simultaneously. This solves the problem of physical area, while also ensuring that a patron receives a totally unique experience every time they enter the gallery. This could potentially be augmented by allowing customers to bring digital photographs of their walls at home and projecting those images around the displays so that a customer can see precisely how a piece would look with their current setup before purchase. 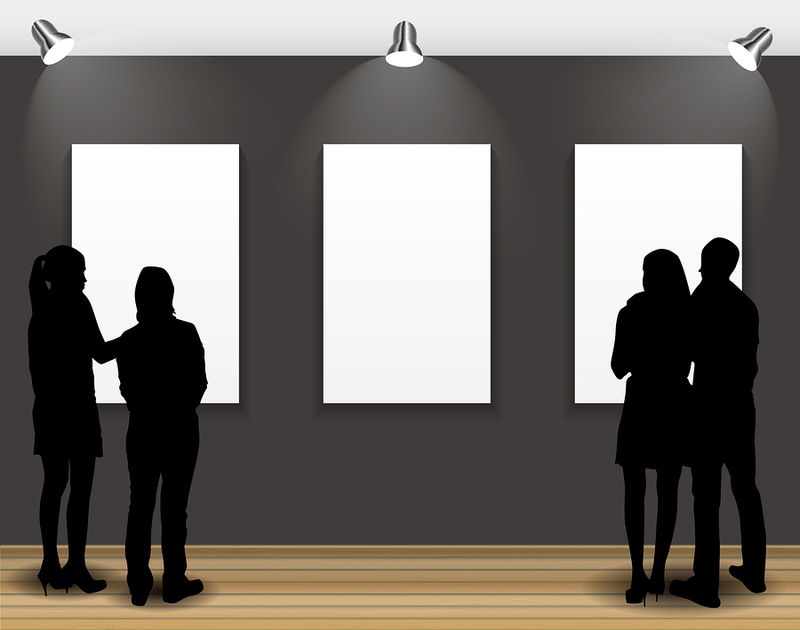 In order to solve the problem of capital, Sergey can partner with two or three other local galleries on this endeavor: they split costs on purchases (and storage facilities) evenly, display all art selections at all galleries, and when any gallery sells a particular piece, it is instantly removed from all slideshows. If four equally-sized galleries each devote 25% of their stock to this endeavor, all four are able to display 75% more individual pieces at any given time for the an additional cost equal to 1/4 of a storage unit. So there you go. A new experience that provides more variety and a more engaging environment, and if nothing else, at the very least a gimmick that is likely to attract media attention and generate publicity. The riddle is, of course, an open one as there are many possible good answers to it. I think it should be good for us to exercise the combination of logic and creativity by thinking of a situation which is not ours. Eventually we do learn from it on ourselves. I like the readers to notice the role of the ultra-rich guy in the story. Is the fact that he is interested in the “business” just a coincidence? Is his interest an opportunity? Take these questions as a hint from my side. Of course, you can answer the riddle without any reference to that person. Please, send me answers until August 7th. Could Sergey negotiate to pay artists only after a piece has sold in his gallery? This could free up significant capital which for marketing efforts. He might also offer to pay a loan fee while the art is displayed in his gallery (especially for the high-priced paintings) and only hold the art for a limited period of time. This new agreement would help reinvigorate the gallery. No pieces would need to remain on the walls unsold week after week. It would allow Sergey to experiment with different price brackets and give him and also the artists more of a sense of what sells and what doesn’t. Other ideas: sell prints of the fine art; sell food/drink; evening events; tap into Rudolf Kempt’s connections to rich people / customers; consider a small entrance fee (refunded if you buy something); customize the “How to” article with pictures of the current stock; have hints next to each picture of where it would best hang in a home. Sergey could also apply the loan fee idea to customers to try to create an unrefusable offer, and overcome any concerns customers have about making an expensive mistake. We want them to take the piece home, display it and fall in love with it. Rather than asking them to pay a loan fee and then pay in full at the end of the month, it might be better if they pay in full but are given the option to bring the piece back after a month for a full refund minus a loan fee. That should put customer inertia in the gallery’s favor! Even if they decide not to keep it, the gallery and artist earna rental fee. Perhaps renting paintings could be just as lucrative as selling them? Thanks for posing the riddle. Fun to think about. The key issue to increased sales is the separation of art by price. People want to gain great quality and a good price and by separating the art into rooms by price people are forced to believe the 3 lower priced rooms are lower quality, and therefore don’t want to buy, while the obviously high quality they want they can’t afford. Simply arranging the paintings to remove the clear knowledge in the customers of quality they will be more inclined to buy. Then ensuring the stock available is structured that there are only a few extremely expensive items, a few cheap options and mostly mid priced will help to frame what is a good deal for customers and sales will increase. Art value is very subjective, so it is quite possible that setting fixed prices leads to some pieces of art being sold very fast (customers believe it is worth more and buy it ASAP) and others remain hanging on the walls unsold for quite a long time. I think some form of an auction system could work quite well. Instead of setting fixed price and have a variable time “from placed in exposition till sold” the gallery could have it vice versa and increase inventory turns. Some experimenting is still needed, to find what is the best time “from placed in exposition till sold” for main groups of art. Also placing art of different price categories in one room would bring more customer attention to other art works and probably increse their sales. For simplicity purposes, I am assuming art usually has a similar margin or throughput %, regardless of the price tag. A piece of art that is several thousands of dollars probably falls out of the “affordable” definition. Because of this, Sergey probably is offering products that are out of the segments he wants to target. I would start by eliminating the pricing categories of rooms. Some people might be scared by the price tag of items, and because buying art is an impulse buy, you might be losing sales because people do not choose to even look at some items. Art should probably be classified by a different standard, not price, but the style or end use. For example, classic/contemporary could be a category that could be used. Because affordable is the target, I would display items within a reasonable range, perhaps capping the upper limit at a sales price of $2,000. It’s important to have a some higher range items (perhaps even a little bit higher than affordable, i.e. close to $2,000) and a lower range of items (say less than $500) mixed together. Persuasion sciences have shown that people usually don’t want to buy the cheapest nor the most expensive items, but somewhere in between. As an example, you could stock the majority of items in the reasonable priced range (say $500-$1500) and have small quantities of items under $500 and over $1500. These small nudges might help induce people buy the items in the “affordable” ranges. I would also tell Sergey to start an email art newsletter, perhaps with monthly issues. The newsletter could be called “How to Increase the Value of your House With Art” or “How to Enjoy Art At Great Prices”. I would teach people that art is similar to wine, and that you do not have to buy expensive items to have good art taste. You could also teach readers on how to best combine different types of arts to make rooms feel fancier or prettier. You could teach people how to decorate their houses at affordable prices. Possibilities of teaching are endless, and Sergey is an expert at it. I would invite new artists to promote their art in the gallery, dedicating a percentage of the space to them. I would run contests to select the best artists, and ask them to place their art in consignment (or at larger discounts), getting free exposure in return. Margins could be shared by the gallery and the artist. I would hold art classes in the museums at hours that do not conflict with the normal operating hours, to increase people’s interest in art. Perhaps easier, I would hold online art classes to improve people’s knowledge and induce future sales. Reducing the stocking of higher priced items will help relieve cash flow. Special arrangements of consignment with new artists should relieve cash flow as well. Helping people improve their artistic knowledge through a frequent newsletter and classes should improve sales. Strategic positioning of art should induce sales of affordable items. Overall, a strategy that focuses on having good affordable items for people who are looking for inexpensive art, should help improve inventory turns, reduce space limitations, improve cash flow and improve sales and net profit. …items that are not displayed are not sold"
2. Decide how to exploit the constraint: Visitors spent more time in contact with moderately priced art items. 3. Subordinate everything to the previous decision: Since "most visitors spent more time with expensive pieces of art" then this pieces of art must be in the four rooms, mixed with moderately priced art items. With this solution, people are going to spent more time in contact with moderately priced art items, so increase the possibilities to see "good art at affordable price", increasing the sales. If sales increase then Sergey could buy "additional excellent and relatively cheap pictures" and people will can see more new items displayed since their last visit to the gallery, and this could attract more potential clients. Well I hope this could help Sergey in his challenge. Sergey could also apply the loan fee idea to customers to try to create an unrefusable offer, and overcome any concerns customers have about making an expensive mistake. We want them to take the piece home, display it and fall in love with it. Rather than asking them to pay a loan fee and then pay in full at the end of the month, it might be better if they pay in full but are given the option to bring the piece back after a month for a full refund minus a loan fee. That should put customer inertia in the gallery's favor! Even if they decide not to keep it, the gallery and artist earna rental fee. Perhaps renting paintings could be just as lucrative as selling them? I tried to comment on your blog, but I’m not sure it went through. Could Sergey negotiate to pay artists only after a piece has sold in his gallery? This could free up significant capital for marketing efforts. This new agreement should help reinvigorate the gallery. No pieces would need to remain on the walls unsold week after week. It would allow Sergey to experiment with different price brackets and give him and also the artists more of a sense of what sells and what doesn’t. Regarding Sergey and his Philadelphia WideArt gallery, I don’t know if it is a TOC idea, but it seemed obvious from your description of the setup of the four rooms that Sergey’s customers aren’t looking at the art that they could buy. They all go to “room 4” where the out-of-reach (but beautiful) works reside. My first thought was to simply rearrange and put up a range of works in every room. This would “force” customers to visit each of the rooms. As some of the less-expensive things sell, Sergey would replace those and the collection would appear to turn over more frequently. (At least the visitor-customers would see variation on the walls, even if they aren’t going to buy right away.) If it is true that potential buyers like to see variety, this could help sales. In general, Sergey wants to make more money from his store. (Sounds like a familiar situation in TOC circles – get more of the goal now and in the future.) Which means more sales and/or higher price on existing sales. On the more sales leg, he needs more people to see the artwork – more foot traffic in the store. And that foot traffic has to contain at least some likely buyers of the art he has available. (I assume web traffic doesn’t net him sales without the foot traffic, but that may not be valid in today’s world.) Could he charge higher prices for the “cheap” stuff if it is displayed with the excellent stuff? I don’t know the art world enough to know which direction people go – do they value things higher when they are displayed with expensive things? Or do they see the massive difference in quality/beauty and value them lower? Assumptions to check. use the artwork, which appears to have created some increase in sales. I would assume doing in-home shows or varied settings at the gallery would help along these lines, but my intuition is telling me there are limited scenarios here and the OE might be higher. Great to be writing to you after a long time. I am reading your blog entries. As for the expensive and slow movers, take a picture or video of them and have digital display kiosks in the 3 rooms (where we have the low to medium priced pictures). The visitors can view these expensive pictures digitally. Website and Mobile App: Along with the above, Sergey also needs to have a website/mobile app with all pictures in his store. This also effectively removes the space constraint to a good extent. He can have a service, where he can ask the viewers to “like” the pictures on website/mobile app. He can dedicate a space in the gallery to showcase the “most liked” online pictures. Thanks for putting up the riddle. I have enjoyed looking at the other answers, and will throw my (lengthy) two cents in. First, Sergey seems to have a clearly defined goal: “Good art at (an) affordable price.” To accomplish this, however, its clear that he must meet the Necessary Condition of making enough money to support this goal. The rooms, and the wall and floor space, are the the constrained resources in this example, as revealed by the coffee conversation with Rudolf — pictures consume wall space, sculptures consume floor space. Also, Sergey should have a good idea of what he purchase a piece of art for and what he might sell it for. He should also have a good sense of throughput. Expensive, one of a kind original pieces have a throughput of one “job.” Lithographs may sell more jobs, but their selling price will be much less. Thus, Sergey may want to determine his Throughput (T$)/constrained space. T$ fits the classic TOC definition of (Selling Price – Raw Material) * Items (up to demand). Constrained space might be in square feet or square inches. Managing inventory is also a consideration for this example. We’ll make the assumption that Operating Expense is not an issue for Sergey – he doesn’t plan on adding or firing employees, and the rent for this gallery is not a concern – Sergey likes the location, and people are willing to come to his site to view his art. So the answer may be increasing throughput by making authorized copies (such as digitized scans printed onto canvas) of the work. The higher Throughput from multiple sales will help T/Space, and the lower Raw Material costs will offset the the lower Selling Price. Smaller copies will also take less space, being sold in a gift store that can potential replace part or all of the last room. The pieces can be kept in space saving flip-through bins. Putting this gift shop right after the pieces that are getting the most positive feedback will allow clients to go from “I wish” to “I bought.” This should probably be near the end of the gallery, and clients can’t get out unless they go through or by the gift shop. Thus, the increased throughput can provide additional working capital Sergey needs. Note, the excellent art work may be expensive, but if it causes copies to be purchased, the throughput of this art is no longer 1 * (SP-RM), but whatever the market demands * (SP-RM). So cheap is not always the answer. Most artists are starving, which helps Sergey set up his “supplier” rules. Art is brought in on consignment; the artist allows authorized copies (or limited, numbered runs); Drum Buffer Rope methods are used to replenish gift shop items, etc. But what is good art? Sergey can filter the incoming art work – those that he deems as “excellent.” However, Throughput Accounting will aid in this filtering process by focusing on profitable art – not necessary “cheap pictures.” Customers will either agree – and buy an original or its copy – or disagree – and not buy anything. Ultimately, beauty is in the eye of the beholder, and demand will make it evident what clients consider good art. Poor throughput art work will be moved towards the front and farther away from the gift shop. The DBR process for the copies will order less frequently for this type of work, freeing up cash. Sometimes the work will be returned to the artist, and and another fresh pieces will be introduced on consignment. With the new supplier rules, Sergey will experience little risk for fresh art. Copies that sell will be an indicator to work with these artists, and poor throughput is indicative of art that is not “good.” Sergey should be careful to keep good relations with promising artists, and make sure poor T$ art does not mean the supplier is a poor artist. The web is a great tool for sales as well, and Sergey should consider social media tools — blogging, email newsletters, Facebook, PinInterest, tweets, videos — that features new artwork, interviews with popular artists, spotlights on up and coming artists with fresh work, and how the copies can be used for decorating in both homes and business. He may license decorators to use this art as part of their design process, and then feature the work and their happy customers in video clips. The copies can also be sold on-line, creating further demand that consumes very little space. • The authorized copies of strong T/Sapce will get into the hands of more clients, who will show them to others, reaching even more clients. • The copies are now moderately priced and affordable to many who come through the gallery. • The increased throughput and new supplier rules have provide much better return on our stock. But Sergey also has a chance to pitch these ideas to Rudolf and leverage his money, knowledge and reach. This may allow for Sergey to gain working capital to break a short term problem. He may also pitch ways to break his space constraint – expanding his gallery, renting space in more promising areas, setting up galleries outside of Philadelphia, leveraging other businesses that are in Rudolf sphere of influence, having a special gala that Rudolf attends with some of the high throughput artists, etc. He should also give some thought about the problems that will arise with success – how to manage the growth of this business without generating any additional undesirable effects. Sergey, time to give Rudolf a call with these good ideas. Having him listen to you one time will be enough! I have attached a draft of a formula for a possible understanding and solution for the Art Gallery. There are of course many questions that need to be considered, for instance if the owner can liquidate his high priced art should he choose to do so for more affordable, attractive art, etc.?. Also if he has lots of excess stock that he is constrained by space to display? My proposal starts with first uncovering the Identity split of the gallery, one of which is perceived by the Market and the other which he seeks to embody. This split when in contact with the reality determined by the market creates the undesired effects. The current reactive measure he has taken has not solved the UDEs significantly. Therefore the direction of the solution should start with him integrating his identity split first, the measure which include a few ideas for marketing followed by space optimization and constant measurement to see what works and what doesn’t. Reserving one room for a virtual display of how reasonably priced art can alter the look of a living space is a great way to connect the gap between ‘art appreciators’ or ‘art curiosity seekers’ and everyday pleasures. The Vision either thru the S&T or not should keep the gallery integrated at all times with their identity and this identity is agile to the market paradigm, intitally giving it what it wants and then later telling it what it should want. Thanks for posting this riddle, am looking forward to see the contributions and your insight into it.